Matt is looking for this same doll. My daughter recently lost her beloved “Bo Bo and cat”. This was the second set we had acquired. She is devastated and finding it hard to get to sleep. Annabelle was a RUSS doll, with brown hair, and a butterfly and a flower on her white jumpsuit. 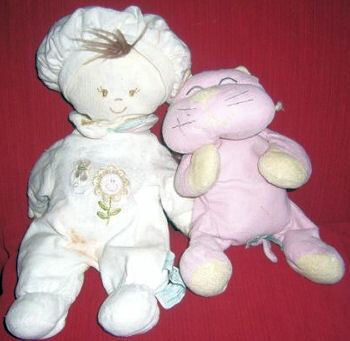 The Cuddle cat was pink and yellow with a rattle, also. If you are still looking believe this is the doll. May have to work with sellers or family in the US for shipping.